5 Recipes to introduce Egg to Baby- When can Baby have eggs? When can I introduce egg to baby? How to give egg yolk to baby? How can I give eggs to baby? Can I give whole egg or only egg yolk to baby? Is it safe for baby to have eggs before 1 year? These are few of the common queries that we receive about giving eggs to baby. Eggs are one of the best sources of protein and even though there have been scare of allergies around it. Most studies now recommend that egg yolk can be introduced into baby’s diet as early as 8 months. Today we share some ways in which you can give egg to baby. Wait for baby to turn 12 months / 1 year old before introducing the egg white as there are chances of allergies. I have received numerous queries about how to introduce egg to baby and include it in infant’s diet. I remember how I tried introducing egg yolk to my daughter when she was a baby and she didn’t like the plain boiled yolk, so i had to find many ways to include it in her diet. If your baby is like mine too and is not very fond of eggs, do not despair. Keep offering it as often as you can. My daughter too took a liking for it after she turned 2, and now her dinner is not complete without an egg. Here I share 2 ways to give egg yolks to baby in this video and 3 more ways in the post. Take a hard boiled egg. Do not give runny egg yolk to baby. Egg should be well-cooked. Always use egg at room temperature or at least kept outside refrigerator for sometime. To boil an egg till hard boiled, put egg in water and bring it to a rolling boil. Boil for 5-6 minutes and then switch off the gas while covering it for another 10 minutes. Take out the egg and cool it. Peel the egg and cut it into half using a knife. Scoop out the yolk. You can use this in many ways. Use a fork to mash the yolk. You may add a little of baby’s milk to make it a smooth mash. Steam/ Boil carrots till soft. Mash the carrots using a fork. Add egg yolk to this mash and mix well. A wholesome meal for your baby is ready. You may also serve mashed egg yolk to baby with other vegetables and fruits like potatoes, applesauce, avocado, bananas etc. Since eggs don’t have any over powering taste, they blend well with almost anything. Add a little of baby’s milk to this and beat using a fork. You may also put a little pepper to it if your baby likes. Heat a little butter in a frying pan. Put the yolk and scramble using a spatula. Mix the egg yolks and vegetable puree or dices in a bowl and beat well. Add a little baby’s milk and mix well. Put the egg yolk mixture and let it cook on one side. Follow the same recipe as above, but scramble the egg yolk mixture using a spatula to give egg to baby. These are very simple to make and a variant to give egg to baby. Cut the bread into 1 inch fingers. Mix the egg yolks and applesauce in a bowl and beat well. Dip the bread fingers into egg yolk & apple sauce mixture and shallow fry in butter. Make these yummy pancakes to give egg to baby. Take atta, apple sauce and egg yolk in a large bowl. Now add the pancake batter to pan. You can use this simple recipe to make a complete meal with egg to baby. Heat butter or ghee in a pan. Add chopped onions and saute will soft. Now add egg yolks and and scramble well. Now add pepper and mix everything well. Egg fried rice is ready for your baby. How do you give egg to baby? 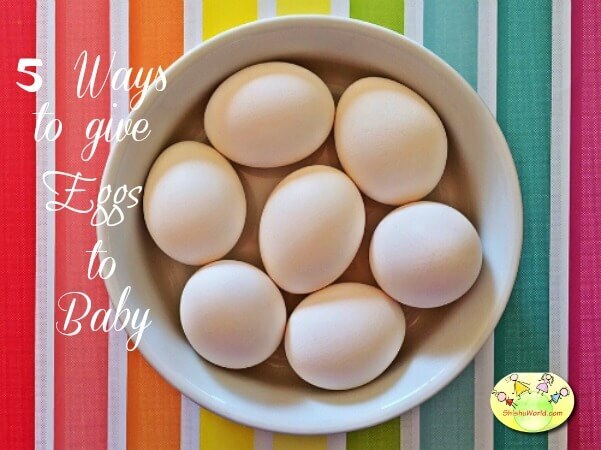 Do you have any more egg recipes that you give to your baby? Do share with us. If you like the article, please share it in your circle. Please leave a comment to ask a question or let us know your feedback. You can follow us on Youtube, Facebook, twitter and pinterest. My baby is in 8th month. Can I give potato nd egg daily to baby…. Will dis create any side effects in future? Give just the egg yolk at this age. You can give potatoes as part of a balanced diet. Can i give mashed boiled egg with milk to my 6months old baby girl? You can start egg around 8-9 months. Egg white can be started closer to 1 year. What does baby milk mean? do u mean it is formula milk? Yes, it means Breastmilk or Formula milk. He had acid reflux problem since he was born and he was throwing his formula too when he. Was 1 month to 12 month . After 12 month we start regular milk and he does like it but after few days he stop drinking then he back to normal and now he doesn’t wanna drink at all .